Better than what you can get at most restaurants and it comes out of your slow cooker! 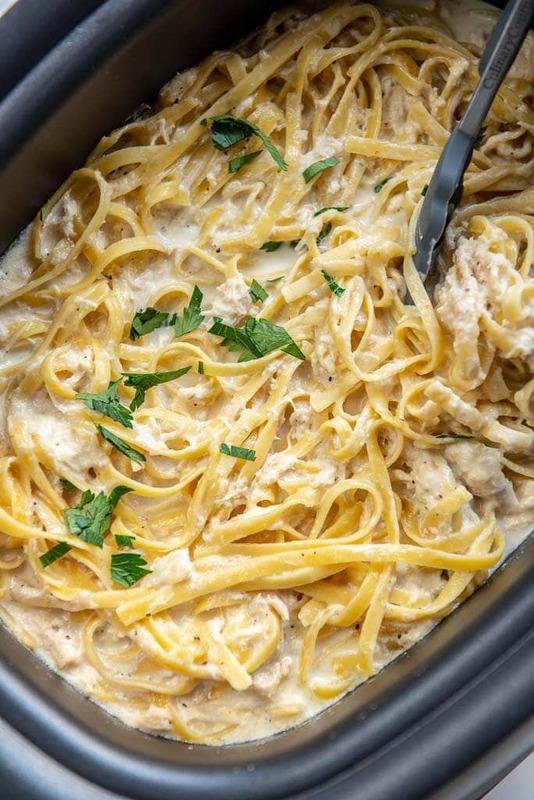 This Slow Cooker Chicken Alfredo Pasta is a family favorite dinner recipe! I’m not kidding when I say this is a family favorite recipe. My family went nuts for this and has since requested it multiple times. And how can I say no, when it’s this super easy to make?! 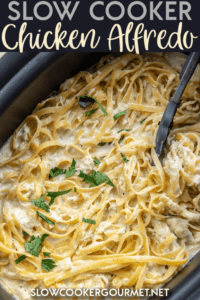 Slow Cooker Chicken Alfredo Pasta is the simple way to get a gourmet style meal on the table without a lot of work or having to pay a lot of money for take-out! I have several recipes here on my blog that use pasta, like this Slow Cooker Buffalo Chicken Pasta and this Slow Cooker Firecracker Chicken Pasta. 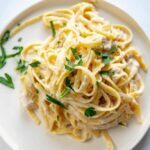 I know it can sound kind of crazy to make pasta in the slow cooker, but with a little practice and by following these instructions, you’ll find it such and easy way to make a meal like this any day of the week without all the work. all of these combine to make a delicious meal! Serve with garlic bread or a green tossed salad. Use a delicious and simple seasoning like this herb & garlic seasoning to keep it simple and tasty! Made this tonight and really enjoyed it. It did really dry out though – I spent the whole day worrying there was too much sauce then there was none left once the pasta had cooked! This looks great!!! Is there a way to use chicken thighs instead? We are trying to use up food before moving hahaha! Yes! If they are boneless, skinless then just swap them out! Thank you for the quick reply! Do I need to shorten the cooking time? Can I use fresh pasta? 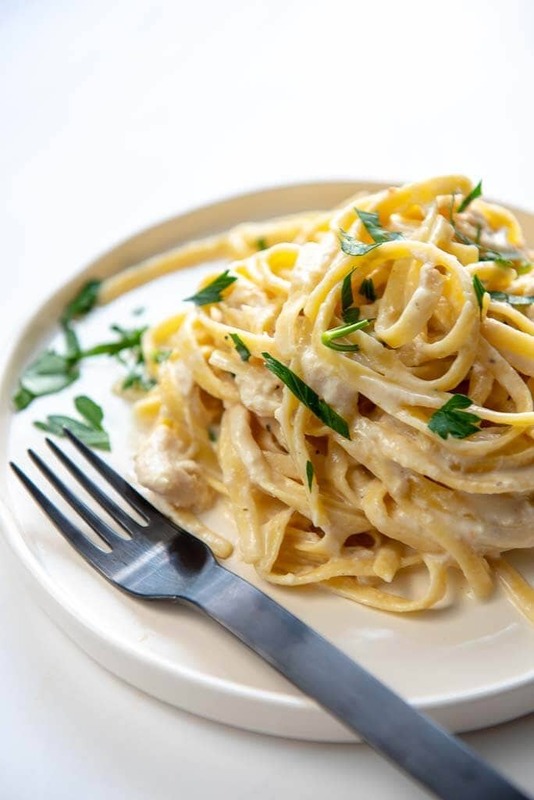 Like the refrigerated sections bertoli linguine? Which would probably shorten the cooking time for that step? Any other modifications needed if so? Yes, but I would reduce the liquid and the cook time for the pasta. Currently I have seasoning, broth, chicken and cream cheese in the crock pot. Do I add the cheese now before the 3-4 cook time? Please help!? Yes, add the cream cheese and shredded cheese at the start. Does it take 30-60 minutes to cook or 5 hours? Hi Talyn! Make sure you check out step 2 – that’s the first part where you will cook the chicken for 3-4 hours on high. The 30-60 minutes is for the pasta. Together the total cook time is 5 hours. Hope that helps! Is there something I can substitute the cream cheese with or just leave it out? Cream cheese is a deal breaker in my family. Hi Allison! I think it would be possible to modify with a little experimenting. Maybe add some cream and extra cornstarch. It’s only a dealbreaker if they know about it! Hi Rachel! You add it in step 2!! Whoaaaaa, hold up. 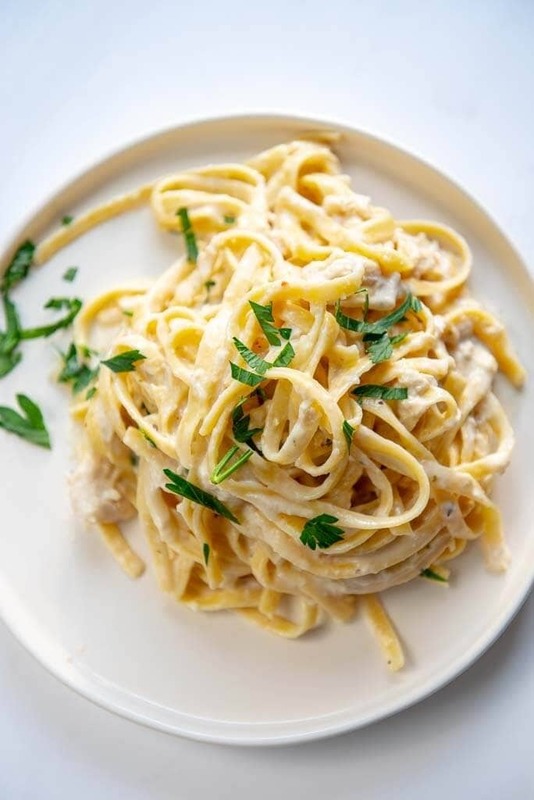 You can make ALFREDO in a slow cooker?! I would have never even thought to try this but it sounds so amazing! I’m giving this a try ASAP. Yes!! Amazingly easy and delicious! What happens if I skip the cornstarch step? The sauce won’t thicken up for you.